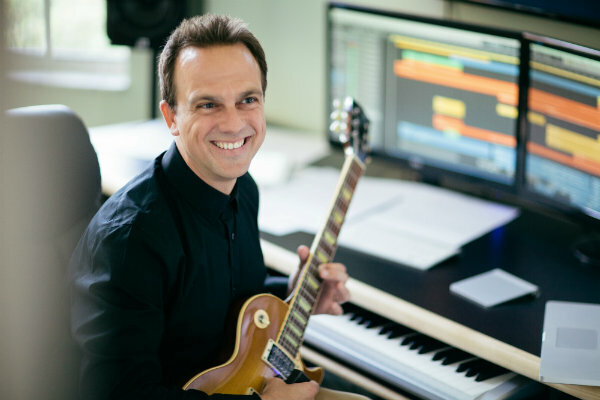 Rivera’s road to an Emmy started years back when he was looking to pick up a little extra income while pursuing his doctorate in music composition at USC. Rivera responded to a posting at a Pasadena music venue seeking a teacher for guitar lessons. It turns out his student was Frank, at the time a screenwriter of some note (Get Shorty, and an Oscar-nominated screenplay for Out of Sight) who had not yet embarked on what would become a successful directing career. Rivera and Frank struck up a rapport. Separately Rivera was assigned a mentor at USC, famed composer Randy Newman. What was supposed to be a brief encounter turned into several hours with Rivera learning from Newman about the scoring process, the pecking order and politics at a recording session. Frank found out about the Newman mentorship and wondered why Rivera hadn’t asked him about working with him in film or TV. “I’m a guitar teacher,” replied Rivera. But Frank still sent him some script pages and gave him a chance to write some music based on them. Though that script never came to fruition as a movie, Rivers said it was a great experience—which made him all the more ready when he heard Frank was going to make his directorial debut on a film starring Liam Neeson. Rivera reached out to Frank and pursued the project. “I emailed him that even if I write temp music which would later be replaced by a professional, I wanted to be involved,” recalled Rivera. He wound up landing the scoring assignment for that movie titled Lookout and teamed well enough with Frank that when Godless came up, the writer-director gravitated to the composer again. Set in the 1880s American West, Godless introduces us to murderous outlaw gang leader Frank Griffin who’s hunting for a former member of his gang, Roy Goode. The chase leads him to a quiet town inhabited, after a mining disaster, almost entirely by women. Rivera’s backstory was reported in SHOOT’s “The Road To Emmy” series of features, which also covered assorted other artisans who went on to win Emmys during the Creative Arts proceedings this past weekend. Among that select talent was Wendy Hallam Martin who scored her first career Emmy nomination and win--in the Outstanding Single-Camera Picture Editing for a Drama Series category--on the strength of the “June” episode of Hulu’s The Handmaid’s Tale. Also scoring her first Emmy nomination and win was editor Selina MacArthur. She earned the Emmy for cutting the “USS Callister” installment of Black Mirror (Netflix). “USS Callister” is a departure form most Black Mirror episodes, with its share of comedy and deployment of special effects. It introduces us to tech wiz Robert Daly (portrayed by Jesse Plemons) as he lives a double life. One has him bullied at his own company called Callister. The other puts him at the helm of the USS Callister, a Star Trek-like spaceship which he captains through the machinations of a video game adventure. Another first time Emmy nominee and winner is production designer Todd Fjelsted--for his work on the “Dusty Spur” episode of GLOW (Netflix). He topped the Outstanding Production Design For A Narrative Program (Half-Hour or Less) category. Set in 1980s’ Los Angeles, GLOW centers on a group of female wrestlers vying for celebrity and stardom on the syndicated pro circuit known as Gorgeous Ladies of Wrestling (GLOW). Perhaps the biggest creative challenge that “Dusty Spur” posed to Fjelsted as a production designer was a montage in which we see many of the characters’ backstories for the first time—albeit in brief, fleeting fashion and sans dialogue. While GLOW marked his first collaboration with Otto, Fjelsted has a longstanding working bond with Watson; the duo has teamed on some 30-plus projects over the years. Fjelsted recalled that his first major television show, HBO’s Looking—which he landed after designing independent features—helped spark interest in him from GLOW producers. A new Netflix television series starring Jeff Daniels is in production in New Mexico.